With spring only a few weeks away in Australia this pasta dish will be on high rotation in the ELE kitchen. Gorgeous fresh green asparagus, creamy buffalo mozzarella and a hint of chilli heat are a perfect combination. As with all ELE recipes this one is simple to make and uses fresh, quality ingredients making it a perfect weeknight dinner. Cook spaghetti in salted, boiling water until al dente. In the meantime, add half of the olive oil to a pan and sear asparagus spears on medium to high heat until they are slightly golden and cooked through, toss through 1 teaspoon of chilli and lemon zest and set aside. Once spaghetti is cooked, drain and toss through remaining olive oil, lemon juice and season with salt and pepper. 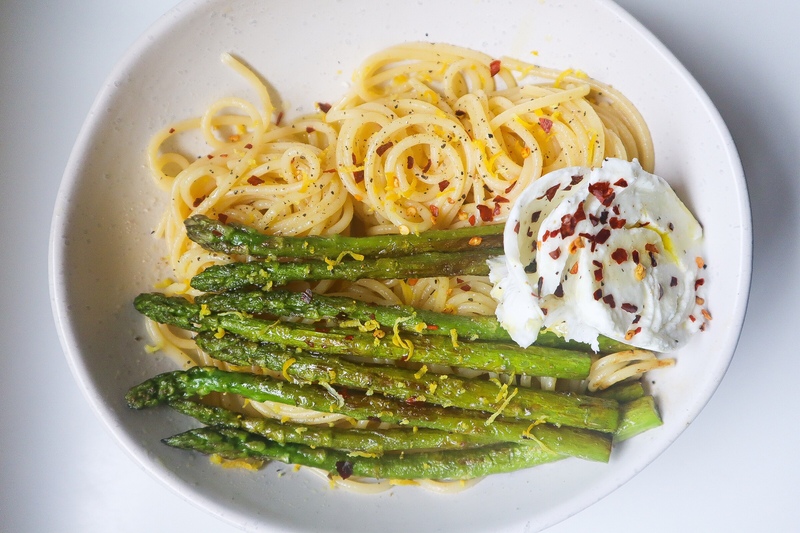 Divide spaghetti between two bowls and top with seared asparagus and buffalo mozarella. Sprinkle remaining chilli on top and serve. Enjoy! *If you can’t get a hold of buffalo mozarella, burrata, bocconcini or even goats curd will work lovely with this dish. Want more spaghetti dishes? Click here for a simple Roasted Tomato and Garlic spaghetti and here for our Spaghetti with Clams. So looking forward to asparagus season! Delicious – now you have me excited for spring asparagus!